Here's the layout and materials for inspecting and cleaning the pickguard / electronics assembly. The pickguard is raised and supported on wood blocks covered with wax paper. The blocks support the pickguard only, and keeps the electronics parts raised off the table, and well supported (old plastic breaks rather easily). Ace Hardware's LUB-E is an excellent light oil for guitar work. It is an excellent penetrating oil, ....and an excellent shining polish to both apply and wipe off with a rag, ....it replenishes oils that have evaporated out of old plastics surfaces and finishes, ....it leaves as heavy a protective film as applied and not wiped off, ....and it is harmless to paint finishes and plastics (actually good for them ....if a finish is reasonably cured). CaiLubeMCL is a high quality spray cleaner & lubricant specially formulated for potentiometers, electronic metal and carbon contacts, and is specifically harmless to plastics. I save scratchless 3M scrub pads made for acrylic tubs, sinks and such, ....that are well worn-out for household use. Their fibres become evermore small with wear. I even scrub rough concrete with one to wear it out quickly and soften it up if I don't have a worn out one, or if one I have isn't soft enough. They work great with penetrating oil to lightly scrub off grime and light corrosion. They are also an amazingly fine and durable abrasive for polishing down paint finishes and plastics. They're also great to apply polishing compounds. The more they're worn out, the finer their grit will be, down to an amazingly fine grit. In most circumstances I also prefer paper towels to clean and polish with rather than cloth rags. They fold and handle easily, stay soft, and by their nature have to be refolded or changed often ...guaranteeing a soft and always clean-enough "rag" to apply, shine, or remove oils and polishes. Rags are great for working larger areas; And I prefer cotton baby diapers and 100% cotton T-shirts, flannel, etc. It is a cardinal "sin" for a guitarist to throw away old cotton T-Shirts, flannel or diapers ! 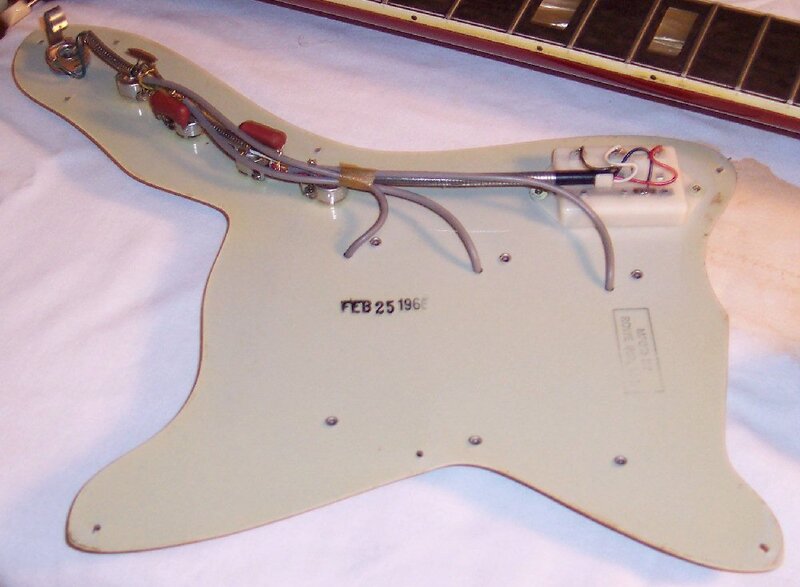 This guitar's pickguard / electronics assembly was made on Feb. 25, 1966, by Rowe Industries (DeArmond). Like the guitar, this pickguard / electronics assembly is in solid near mint condition and untouched. These electronics are remarkably high quality design and work. The switch wires are run through a grounded metal flex tube shielding ! ....and the pickup leads are shielded Belden cable. The capcitors are high quality for this application. The wire routing is expert, aligned and tight; No loose / wild / chaotic wiring here ! 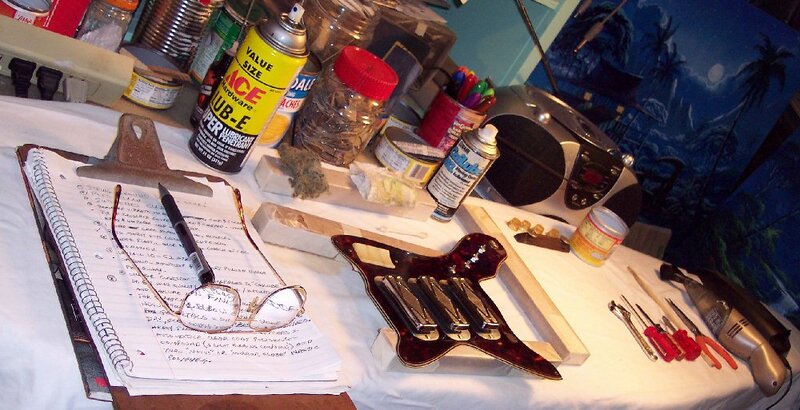 When these very small pots first came on the guitar scene, many guitarists thought they were "cheap japanese crap"; But actually, the space saving design came from NASA's space program. Although they were / are not of mil-spec quality, they worked well and still do. BUT, because their knob shafts are VERY small, care must be given to ensure that the knobs are gently pushed all the way down in contact with the pickguard, ....which will help prevent any strain against those small shafts. The switches are tight and show no signs of any substantial wear, looseness, etc. Care must be given to lubricate the switches every year or so, with a high quality spray lubricant / cleaner such as CaiLube. The switches assembly is plastic and not of Switchcraft quality, but should serve well if cared for. Plastic does degrade over time, although the plastics on this guitar appear to be in excellent condition ....except where noted in these webpages. Polishing and replenishing plastics and finishes with oil REQUIRES excess oil be wiped off. THEREFORE YOU MUST REMOVE THIS PICKGUARD TO SPRAY CLEAN / LUBE THE POTS, SWITCHES AND JACK. A PERSON SHOULD NOT TRY TO LUBRICATE THE SWITCHES AND POTS ON HARMONY SILHOUETTES THROUGH THEIR TOP PARTS CLEARANCE GAPS WHEN THE PICKGUARD IS INSTALLED. 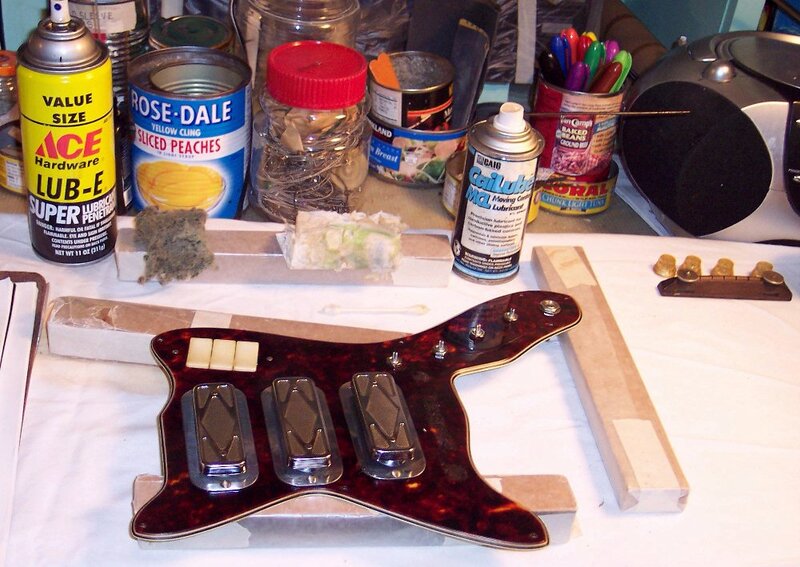 THE EXCESS OIL WILL RUN DOWN UNDER THE PICKGUARD THAT IS MOUNTED FLUSH AGAINST THE FINISH, WILL BE TRAPPED THERE FOR A LONG TIME IN TOO LARGE A QUANTITY, WILL RUND DOWN INTO SCREW HOLES AND TURN THE WOOD THEREIN TO MUSH, AND LIKELY DAMAGE THE PLASTICS AND FINISH BY STANDING TRAPPED IN TOO MUCH OF A QUANTITY. Notice that, except for the bolted-on pots, ....everything else in the electronics harness is riveted to the pickguard. So if any future work is needed, planning for an expert rivets removal and re-riveting should be planned for if this guitar's fine original condition is desired to be preserved. Reputable computer repair shops should have the ability to work with rivets. An airplane repair shop would also have expert experience with the nature of both rivets and of delicate parts maintenance.